We know that capoeira is part of a culture and has begun working its way into the hearts of many other cultures around the world. 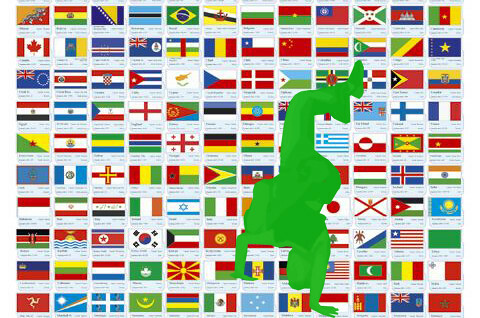 But have you ever looked at all the different cultures within capoeira itself? A long time ago, I wrote a post about how it hit me that capoeira is truly an international sport. While I trained with a capoeira group in France, for instance, I would hear in French some of the exact same lessons and ideas I’d been taught in Canada, in English (which, of course, were all first conceived in Portuguese). At the same time, I couldn’t help but notice a world of differences, as well. In fact, I’m pretty sure that it’s safe to say I experienced more culture shock within French capoeira than within France in general for a lot of other things on my exchange! I was thinking about this recently, and it made me wonder: just putting aside for a minute the bottom line that capoeira is capoeira, no matter who, what, or where…how does (or might) being nested in a particular culture affect the capoeira that capoeiristas there practice? Does “Capoeira” mean the same thing to people in Russia as it does to people in Spain? If we all had a turn on Freud’s couch, would hearing “capoeira” trigger the same words and associations in a Swede’s mind as in that of a New Zealander’s? I know my mental tag cloud for (my experience of) Canadian capoeira, infused with North American culture and mentality, would definitely hold a different set of words than the one for (my experience of) French capoeira. The first would be something like “training, dedication, quality, tough love, relentless, standards”. Although capoeira still involves fun and games and playing around, at the end of the day, training, we’re told, is serious business. Being late is definitely not a smart thing to do (unless you enjoy push-ups, squats, and/or sprawls), and, except for total beginners, anything less than pushing yourself to the limits is not good enough. The second tag cloud would feature words like “training, relaxed, laid-back, playful, casual”. People thought I was crazy when I trained with a frequency normal to my Canadian group, and I thought they were crazy for closing on weekends and school holidays! If someone was late, nobody batted an eye. While in North America I’d always associated capoeira batizados with “training harder, goals, being ready”, in France (and Italy) I learned their new meaning as heralds of “road trips, partying, hooking up”. Just last week, one of my teachers and some students laughed uproariously at the ridiculous and unheard-of idea of “going for drinks with Mestre”. In France, that’s totally what we did; the mestres bought the drinks! (Chan, any comments? 😛 ) Finally, at a batizado in England I met a capoeira teacher from Poland whose students basically constitute his crew of friends, only nobody drinks or smokes because—he doesn’t allow them to. Not that I necessarily condone drinking or smoking, but can you imagine that level of…integration…between you being a capoeirista and the other parts of your life, so much that someone who is essentially “one of the guys/girls”, by virtue of also happening to be your capoeira teacher, has that kind of “authority” over you? To me, at any rate, that’s mind-boggling—but to them, that’s capoeira. At the same time, I absolutely realize that such comparisons/observations are to be taken with a grain of salt. Leaving aside grupo-rooted (not country-rooted) differences, the very fact that they constituted a “culture shock” to me might have made such differences more pronounced than they actually were, and of course, that works both ways, between everyone. For instance, in France I saw my Canadian capoeira academy turn into a military regiment run by a brainwashing dictator, and back in Canada my French capoeira friends were revealed to be drunkards stumbling high around a roda. Neither, needless to say, is the truth!! At any rate, that’s what I mean by capoeira being a different sort of activity depending on where you find it. And it’s not like the French capoeiristas I met cared or liked capoeira less, or that capoeira is more important to people in my Canadian group than in my French group. In fact, I met a lot more students there who had already been to Brazil or knew some Portuguese, than I’d met in Canada. It’s just that practicing capoeira, or being a capoeirista, connotes different things for each—and really, isn’t that just like capoeira? REMINDER: November 30 is Mandingueira‘s ONE-YEAR ANNIVERSARY! I will be releasing my secret project on that day to celebrate, so be sure to drop by and check it out! I’m also hoping to have a second MAJOR surprise for you guys, but as it’s not yet a sure thing I’m waiting to announce it. One more week!! I wonder if this really is a nationality thing. Our group is the biggest in Belgium and we train in various cities. Almost every place has a different teacher and I can assure you that each place has a different capoeira culture. We have places were people train really hard and the trainer wants his students to be though in fast paced roda’s, others balance their classes more with a good focus on traditions and music while yet another group couldn’t do capoeira without focussing on floreios. And yet we’re all Belgians and the same group. touché! I guess xixarro’s right, joaninha. The different cultures between groups are, I assume, more variable than the different cultures between nations. It’s true that there are differences in European and Asian Capoeiristas. It’s true that it means something different to Brazilians than to North Americans. But I guess the same difference does exist in its meaning for some Afroamerican Capoeiristas in North America compared to their Asian American comrades. And so on. But you are right… the topic is damn interesting and it’s worth to keep an eye on it. good job! 🙂 and yeah, I am also curious what you’ll come up with at your anniversary! I find the idea of researching how Capoeira is played and how Capoeiristas think throughout world extremely fascinating. The problem is (not that you guys haven’t already discussed it) there are so many variables in determining how the culture of the country impacts the academy itself. As you mentioned, the “academy culture” can differ not only between groups but between cities. As instructors love to repeat at workshops, every Capoeirista should be and is completely different and unique. The different attitudes and backgrounds of each student will impact the academy in a certain way. More importantly, no matter where a Brazilian instructor decides to start her academy, as the leader she will control how the academy is run (how disciplined or relaxed classes are, general attitude, philosophy of the game, etc.) Thus it seems her own personality and background will have the greatest impact on the “academy culture” itself. Her opinion on Capoeira issues will generally be the first to influence beginner students, and they will likely agree until they are exposed to something different. If her mestre had no tolerance for lateness back in Rio, my guess would be her academy would be run no differently (whether it was in France, Canada, or Australia). I know my mestre had an enormous effect on my attitude and personality (especially in regards to Capoeira), but obviously to some degree the country I grew up in will affect how I train, how I integrate the lessons of Capoeira into my life, etc. I suppose if one were to research how a culture affects Capoeiristas and “academy culture”, you would really have to examine the specifics. I think this is a project worth the time and effort (which I might even consider some time in the future) and I applaud Joaninha for bringing it up. I’ve trained with several different groups (within the U.S) and have seen that each one has their own group culture. Some of this was influenced by the region I was in. West coast groups were more relaxed and East Coast groups more aggressive and competitive. But even within one region or under one Mestre each group had their own capoeira culture. Some groups were super laid back, others super strict, some were in between. The styles varied greatly, too–even if I was training with sister groups of my own group. I thinks it’s hard to figure out how much the culture at large influences capoeira culture. I think a lot of it has to do with the instructor and his or her own personality. But then the students also influence the instructor in some way, too. Great post! Keep up the great work! Great post Joaninha! Panama you are exactly right about coastal differences by the way. I have been on both also and that is a very accurate description. Hi Garca, thanks for your comment! You’re very right actually, thinking back, the person in charge of the academy has an almost singular influence over how it’s run and how the general philosophy and atmosphere of the place turns out. Thanks so much…and if you ever do end up doing that study, I’d love to see what you come up with! Now THAT would be something super interesting to look into! How students might influence their teachers over time, especially if for ex. it was someone who grew up in Brazil and then moved to another country to teach. Hahaha Xixarro, aw I didn’t mean it as a bad thing!